Well here she is! 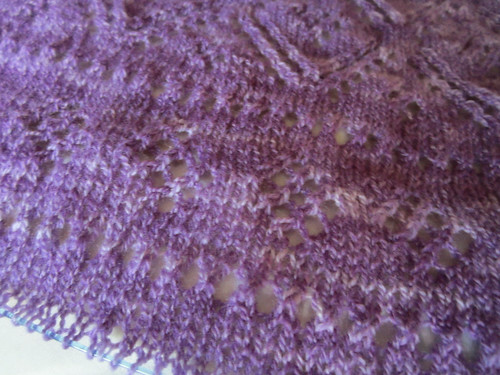 I struggled to get decent pictures of this gorgeous shawl which I think is due to our color choice more than anything. The Ironstone is very hard to capture without a light box. It is lovely and dramatic in this darker color, but it is fact that lighter colors would show off the lace work better. As a refresher, we knit our Kimani with 2 skeins of our Classic Merino Superwash Sport yarn in the color Ironstone. We used almost all of the 2 skeins and knit it on size 5 US needles. You can buy the pattern both on Ravelry and at our website. 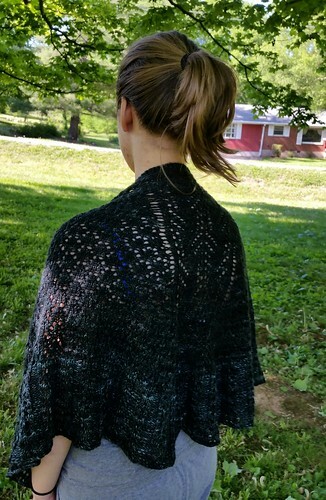 As you can see this shawl is a much shorter style crescent shape which is my favorite kind. 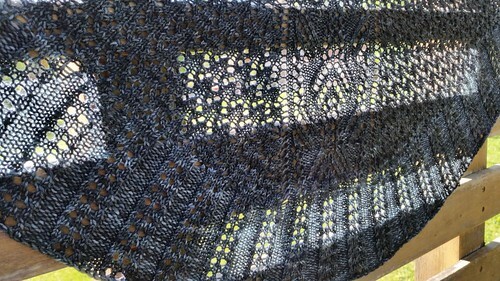 I measured mine after blocking and it was about 68” across the top edge and 22” in the center length. 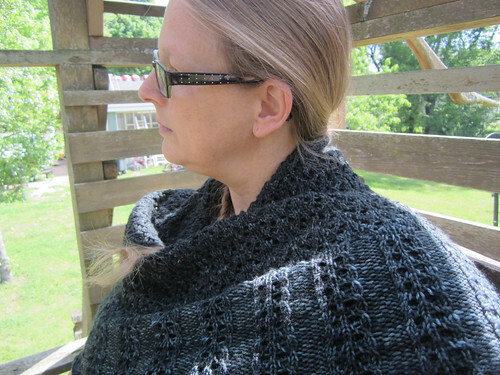 It is so easy to wear this shape shawl as a shoulder drape or more like a scarf. I also promised an update on the other stuff we have on the needles in this post so let’s get to it. 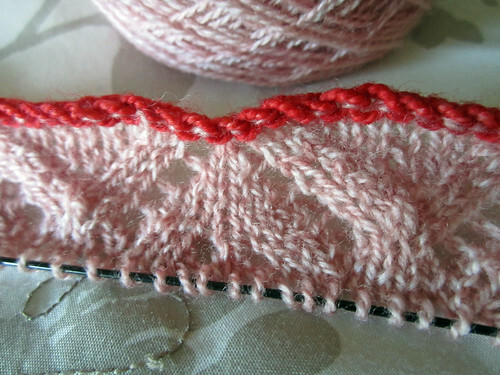 First up is Cassie’s new project; Liz Stole which we are knitting in our Classic Merino Lace in the color Tea Rose. The red yarn you see there is the provisional cast on because this shawl is knit from the center to the edge and then back to the center and worked to the other edge. 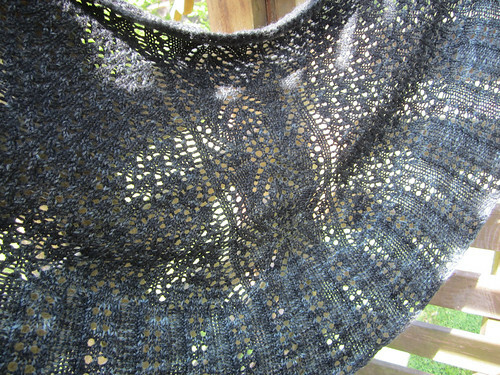 Joanie picked to work on the companion shawl to Liz Stole, Elizabeth Shawl. 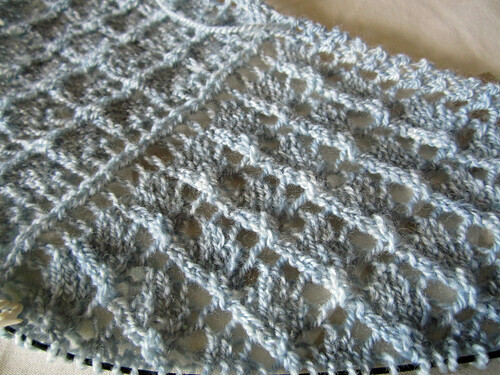 We are also using Classic Merino Lace yarn for this one in the color Winter Sky. 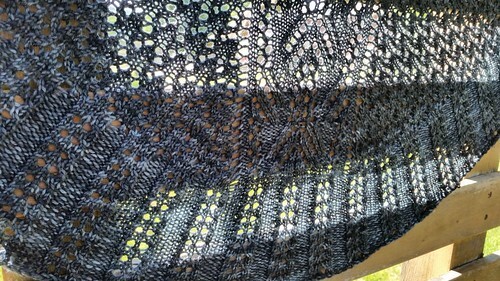 Border of Nadira is coming along but rows are getting pretty long at this point as they are on my Edwina shawl below. I just completed the first of 4 border charts yesterday, which means I have 56 rows to go, counting the bind off. I currently have 367 stitches and by the end will have 487. Yikes! I really want to have this done before I leave for Minnesota a week from today. We shall see. 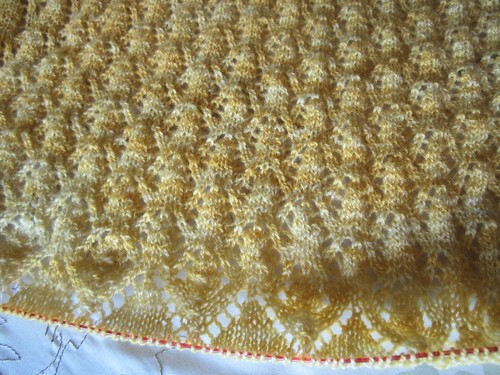 :-) And no, I am not going to do the math to see how many actually stitches I have to knit to complete the shawl. Some things are better of remaining unknown lest we lose heart. If you are inclined to such calculations please let me remain in ignorance, okay? LOL!